It’s no secret I indulge and sometimes (OK, mostly) enjoy conspicuous consumption. I think fat women in particular have been denied the right to enjoy fashion and consume it the way that straight sized women have been able to (or, I suppose, the way that well-off women, who would likely to be able to afford custom-made clothing, can). I am on the smaller side of “plus” and have some trouble finding well-fitting clothing in high street stores, and I have next to little luck in designer or vintage stores. The plus sized sections in the latter stores are usually confined to the back of the store or at the corner of the store and the selections on offer? Not so great. For women larger than “in-betweeny” size, there’s a struggle, or they’re relegated to accessories only. The same sort of thing can happen whenever clothing swaps amongst friends are organised. If you only have friends that are on the smaller end or slim, then there isn’t going to be much for you to swap. This year, there was a somewhat successful Brisbane Fatty Clothing Swap, but it could have been better – we may have needed to do more advertising or talk it up some more. But the Swap sparked the idea of A Plus Size Wardrobe, which is getting a lot of advertising, sponsors and likes on its Facebook page. A Plus Size Wardrobe is a clothes fair for pre-loved clothing, all plus sized! Which means that if you identify as plus sized, there is very likely going to be clothing for you to buy or swap! No more going along to an event, only to find that nothing being sold or swapped at the event is likely to fit you at all. Yay! It will be held in Brisbane again, on the 15th of December at Oxford 152, Oxford Street Bulimba from 12-4 pm. It’s free entry and cash only stalls, so bring cash along if you’re planning to buy. I’m not personally having a stall myself as I don’t have anything to swap or sell at the moment (I know, GASP), but I will hopefully be along to check out other people’s wares and if something catches my eye, well, another person’s goodbye could be my hello. So if you’re in Brisbane or can get to Brisbane and aren’t doing anything on the 15th of December, come along! Find a bargain! 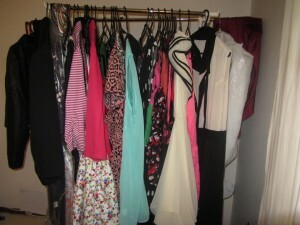 This entry was posted in Fashion and tagged a plus size wardrobe, brisbane, clothing, fashion, fat, fatshion, swap, women. Bookmark the permalink.